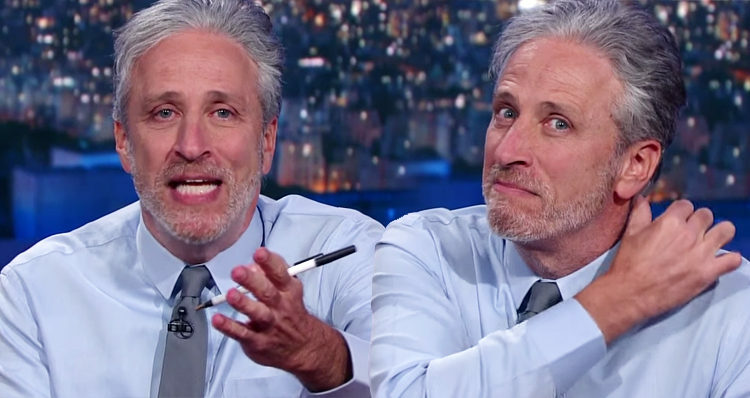 Jon Stewart made an appearance on The Late Show to tell the media how to break up with a**hole Trump. Jon Stewart returned to Stephen Colbert’s The Late Show on Monday for the second time in less than a month, to mock the media’s breakup with Trump. Colbert was discussing the First Amendment at the beginning of the segment. “Stephen – I’ve spent the whole day yelling to the animals about Trump,” he added, referring to life on his farm. Stewart spent the next few minutes calling out Trump’s lies and playing clips from Trump’s first solo press conference earlier this month. Facing the camera, Stewart delivered one of his best rants ever. Hey guys, hey media, so, I heard Donald broke up with you. Stings a little, doesn’t it? You finally thought you’d met your match. A blabbermouth who’s as thin-skinned and narcissistic as you are. Well now it’s over! Well, good riddance, I say! Kick him to the curb. Yeah, how’d that work out?” It didn’t. And you know why? Because 70-year-old men don’t get less cranky or racist as time goes by. Unless they happen to be visited by three spirits in the night. Here’s my point, media. Here’s my point. This breakup with Donald Trump has given you, the media, an amazing opportunity for self-reflection and improvement. Instead of worrying about whether Trump is un-American; or if he thinks you’re the enemy; or if he’s being mean to you; or if he’s going to let you go back into the briefings; do something for yourself. Self-improvement! Take up a hobby. I recommend journalism.